Big things surely come in little packages; packages that can often times be devoid of flamboyance, sometimes dour and in some cases unattractive. However, they often come with big surprises and loads of goodies; experiences that could leave one in a state of awe and with an adhesive impressions or memories. Bet, the above expression aptly sum up the ‘hangover’ state and feelings of sports enthusiasts, most especially table tennis fans at the just concluded 16th National Sports Festival held in Abuja, last year. Nigeria’s foremost sports’ festival had gone under the radar for six years (2012) but, made a return in Abuja last year amid less pomp and fair. Abuja 2018 wasn’t really electrifying but, at least, it changed the country’s table tennis narrative by heralding a new star; a star for the future; one ready to take the baton of female table tennis. “I never expected it really it still feels like a dream. Competing for honors under Lagos state colors was a memorable and gratifying one but, creating a storm like I did against a veteran; someone that has given much to the sport and has served this country well still remains unbelievable,” gushed Niimota Aregbesola to Weekend SportingSun. Yes! Niimota Aregbesola is the new kid on the block as the country continues to churn out future stars in a sport that has given much to her but, has received little in terms of support and funding from the government. Aregbesola represents one in the humongous yet to be “unearthed diamonds in the dirt” that lie fallow in her sporting mines. Sharing the same surname with former Osun state governor Rauf Aregbesola, one might be forgiven for concluding hastily that she’s from the “state of the living-spring”. “Laughs, I am not from Osun state, I am from Lagos,” she reveals to The Sun Sports on Saturday. “I have always been like that, cool, and easy-going. I guess am phlegm so, I get to keep to myself and just focus on things I need to do. But, it doesn’t make me an introvert. I talk and am very expressive,” she tells the reporter. For a country plagued with massive unemployment, social problems that have resorted in idleness amongst youths thereby forcing them to embrace drugs, prostitution and other vices, table tennis probably created a distraction and comfort for Aregbesola. Just like the biblical story of little David’s conquest of Philistines’ enfant-terrible, Goliath “the Giant”, Niimota’s conquest of Nigeria’s female table tennis veteran Funke Oshonaike would probably go down as the biggest spectacle of last year’s Sport Festival. 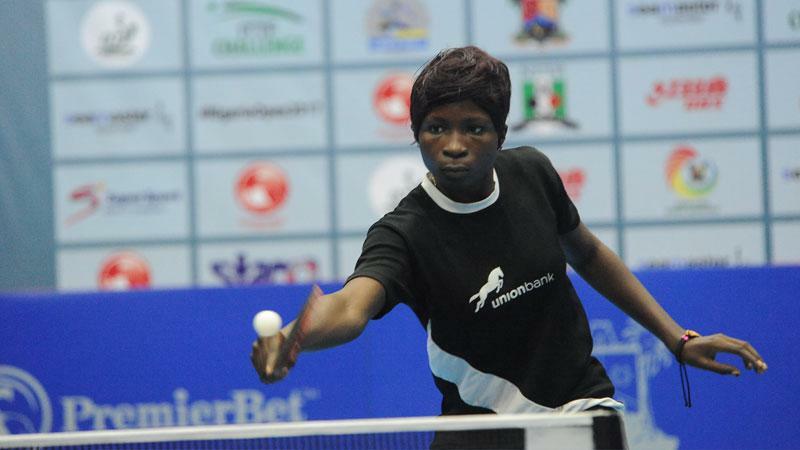 For a nineteen-year-old taking on an opponent that many regarded as one of the best and greatest female table tennis player to ever come out of the country and the African continent, many neutrals, fans and even critics would have been forgiven for predicting a Funke Oshonaike victory. It was simply a walk in the park for the veteran tennis star. The clash was a one-sided one, a meal ticket for the six-time Olympian. It is like a cat taking on a Tiger-Already it is a lost course. And so was Niimota’s against Oshonaike. Abuja was just the first National Sports Festival in her fledgling career and behold, she had Oshonaike representing Akwa Ibom state to contend with in the last-16. Fate was definitely cruel to her on this day. The stats and odds were starkly against her. But, this little unknown champ had something extra in her goodie bag. She wasn’t going to cave in to fear. The grandeur of the occasion coupled with the aura, clout and profile of her opponent won’t break her rather, they spurred her. “Whenever I’m playing I think positively. Positive thinking would bring out the courage in me thus enhancing my ability to perform well. “Against Funke Oshonaike I just summoned my confidence and faith. Table tennis is about having competitive spirit you mustn’t let your guard down. I stayed focus and stuck to my game plan and glory be to God, I won,” she explained. Yes she won, edging her more illustrious opponent in best of seven games by 4-3. She described her joy and the excitement in her camp after securing an historic upset. “I felt so excited and overwhelmed with joy. It was the greatest achievement in my young career for crying out loud. My coach and my parents were happy too,” she revealed. Real victory worthy to be celebrated however, the upcoming star who just finished her OND at Yaba College of Technology isn’t carried away. She intends to keep her feet grounded as she aims to improve on her game and carve a niche for herself in the sport. Big dreams, big ambitions for the 19 year-old as she is ready to create her own legacy in the sport, Weekend Sportingsun gathered. “I am working harder I believe the exposure at last year’s sports festival is a right step in the right direction. I want to improve and the only way I can do it is to continue to work on my game,” she emphasized. Well her statement only shows Niimota and many vibrant female tennis players are ready to wrestle the spotlight from the veterans. Asked if she sees herself towing Oshonaike’s path, she replied: Yes, she is a role model for me and other female table tennis players but, I intend to chart my own path and right my own history too. Charting her own path it is, nobody can dispute this, after all she just caged a Tiger.